Most airlines nowadays make it easier than ever to take your service dog on trip with you. Many airlines offer an accommodating airline service animal policy that allows your dog to join you directly in the cabin. You can make traveling with your service dog even easier by outfitting your dog in a service dog vest to make it easily recognizable as a working dog to airline staff and fellow travelers. 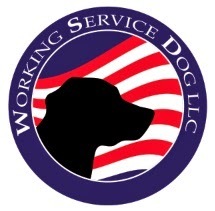 Here are five more travel tips from WorkingServiceDog.com to make sure your next trip with you canine companion goes as smoothly as possible. Although many airlines accept service animal and service dogs, it's always important to verify the airline's policy before booking your flight. It it is advisable to call ahead to the airline to notify them that your service dog will be accompanying you on the flight. Usually they will note your ticket that you are accompanied by a service dog. A service animal may accompany their handler in the aircraft cabin if the service dog can be accommodated without blocking an isle or areas used for emergency evacuations. If the service animal is too big to sit under the seat or at the handler’s feet without intruding on another passenger’s space or obstructing the isle it will need to travel in the cargo hold. Be aware that others may also be traveling with their service dogs on your flight. Some airlines may have a limit as to how many animals – either service animals or regular pets - can be aboard the plane at any time. This is why it's important to call ahead and advise the airline you have a service dog as soon as possible. Of course a service animal will most likely take precedence over a regular pet in the case that the animal count limit is reached on a select flight, but it is still good practice to inform your airline in advance to avoid any issues. Find out ahead of time what vaccinations or health certificates are required for your service dog to fly. Then book an appointment with your vet to make sure that your dog has a clean bill of health before embarking on your trip. Not all dogs are created equally and certain breeds carry more of a flight risk than others. The Humane Society recommends that dogs with “pushed in” faces, such as bulldogs and pugs, should not travel by plane. Flying with service animals has never been easier, especially when you follow all the above steps. Don't forget the number one tip and make sure your service dog is equipped with a noticeable service dog vest.